We are a family farm raising and selling beef. We are not what is widely known as a feed lot. We have 40+ acres in pasture for our cows. We typically have 16 cows and 1 bull. They feed on grass or hay. We do not administer antibiotics unless a cow has an illness that requires the medication. We are in northern Alamance County. The postal address in Burlington, NC but we are north of Burlington. We have Hamburger, Filets, NY Strip, Ribeye, and Sirloin or the whole cow. You can split a cow with people if you don't want or have room for a whole cow. If you are interested or want to place an order you may contact us via the link above or you can submit a request of the meat you want. Our hamburger is now for sale at Company Shops Market in downtown Burlington, NC. Site is a work in progress...and has been for some time. It is updated when we can. 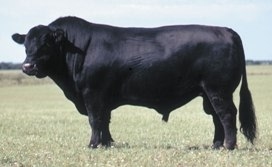 This was our original bull, T-bone.